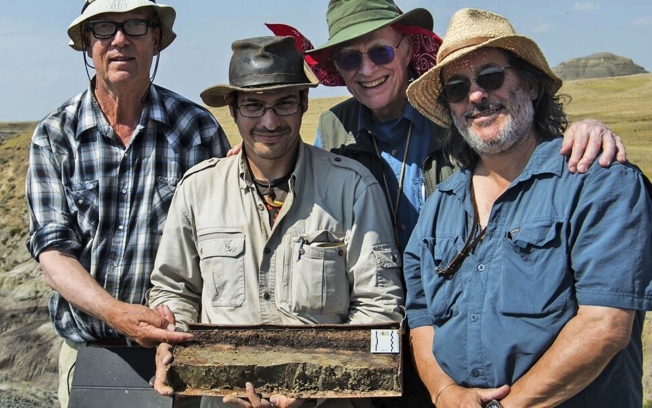 This handout photo obtained Saturday, March 30, 2019, courtesy of the University of Kansas, shows, from left, researchers Jan Smith, Robert DePalma, Walter Alvarez, and David Burnham as they collect a box core sample of the KT boundary from the Tanis deposit in New Mexico. The scientists say they have discovered the fossilized remains of a mass of creatures that died minutes after a huge asteroid slammed into the Earth 66 million years ago, sealing the fate of the dinosaurs. Separately, University of Amsterdam's Jan Smit disclosed that he and his colleagues even found dinosaur footsteps from just before their demise. Smit said the footprints — one from a plant-eating hadrosaur and the other of a meat eater, maybe a small Tyrannosaurus Rex — is "definite proof that the dinosaurs were alive and kicking at the time of impact ... They were running around, chasing each other" when they were swamped. "This is the death blow preserved at one particular site. This is just spectacular," said Purdue University geophysicist and impact expert Jay Melosh, who wasn't part of the research but edited the paper released Friday by the journal Proceedings of the National Academy of Sciences . Melosh called it the field's "discovery of the century." But other experts said that while some of the work is fascinating, they have some serious concerns about the research, including the lack of access to this specific Hell Creek Formation fossil site for outside scientists. Hell Creek — which spans Montana, both Dakotas and Wyoming — is a fossil treasure trove that includes numerous types of dinosaurs, mammals, reptiles and fish trapped in clay and stone from 65 to 70 million years ago. Kirk Johnson , director of the Smithsonian National Museum of Natural History who also has studied the Hell Creek area for 38 years, said that the work on the fish, the glass and trees "demonstrates some of the details of what happened on THE DAY. That's all quite interesting and very valid stuff." But Johnson said that because there is restricted access to the site, other scientists can't confirm the research. Smit said the restrictions were to protect the site from poachers. For decades, the massive asteroid crash that caused the Chicxulub crater in Mexico's Yucatan Peninsula has been considered the likely cause of the mass extinction often called the "KT boundary" for the division between two geologic time periods. But some scientists have insisted that massive volcanic activity played a role. Johnson and Melosh said this helps prove the asteroid crash case. Seeing a dinosaur skeleton when you walk into a museum can be a special moment. That's why we were shocked to find out a lot of museum bones are replicas. When we dug deeper, we found it it's a good thing. 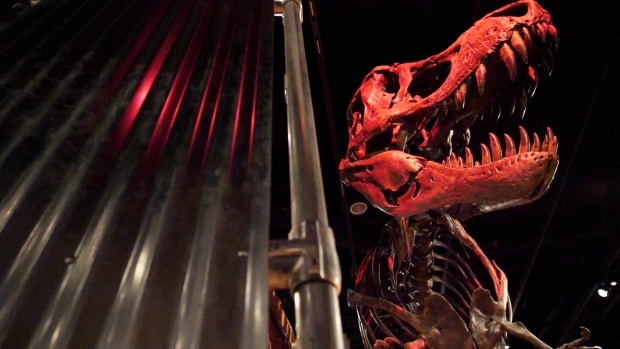 Learn about the history of museum bones and replicas, where they make them and how replicas affect everything from how dinosaurs are displayed to what you learn in school. There was more than dinosaurs, he said. The site includes ant nests, wasp nests, fragile preserved leaves and fish that were caught in the act of dying. He said that soon after fish die they get swollen bellies and these fossils didn't show swelling. The researchers said the inland tsunami points to a massive earthquake generated by the asteroid crash, somewhere between a magnitude 10 and 11. That's more than 350 times stronger than the 1906 San Francisco earthquake. Purdue's Melosh said as he read the study, he kept saying "wow, wow, what a discovery." The details coming out of this are "mind-blowing," he said. Science Writer Christina Larson contributed to this report.